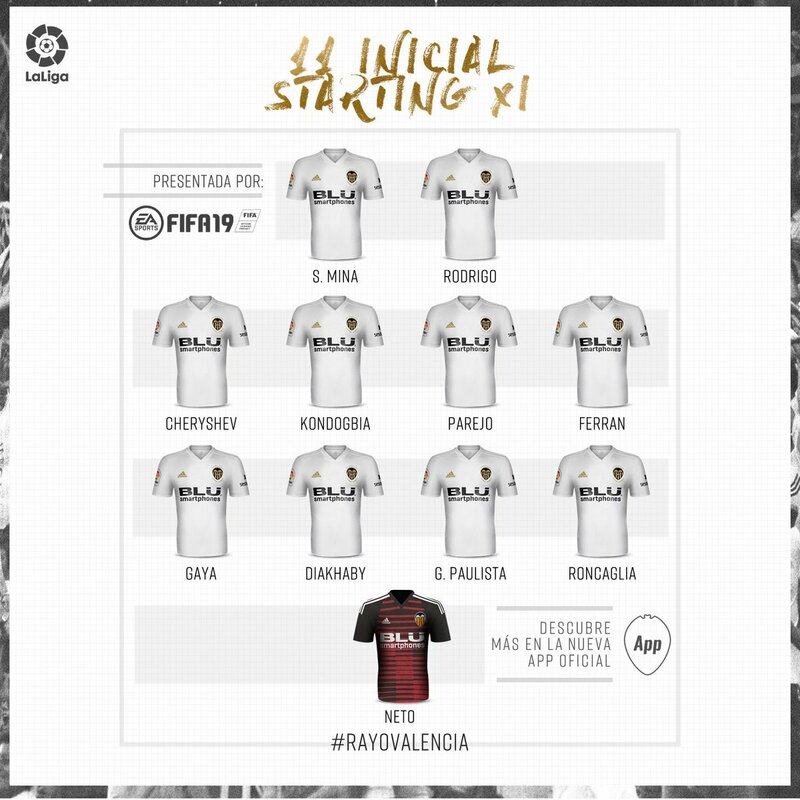 Valencia goes to Vallecas today to try and finish an excellent week by winning and getting into the Champions league places, at least temporarily, for the first time this season. With a Europa league game coming up on Thursday there are, as expected a few changes. Garay gets rested in favour of the returning Paulista. Wass gets a break and, with Piccini out, Roncaglia starts there instead. He's only played once there this season, so this is a bit of a gamble. Cheryshev and Ferran start instead of Guedes and Soler, with Mina in instead of Gameiro. Parejo's yellow card in the last game was rescinded after the club's appeal. Not sure that's a totally good thing. This is one of the easier remaining games and it might have been better for him to sit this one out and reset his yellow card counter than be missing for a future important game. Rayo have danger men like the Real Madrid loanee De Thomas, but the club is in the middle of an awful run: last week's home draw with Betis is the only point they've got in the last 9 games. If Valencia wants Champions league, it's imperative that we win games like this. A poor first half. Valencia did put a couple of good balls through for Ferran. In the first he shot wide when he might have tried to find Rodrigo and in the second he was closed down by the goalkeeper. There was a warning shot soon after. Parejo dawdled on the ball instead of clearing it, got robbed and their shot was just wide. This is something that's crept into our game in recent matches: we get overconfident around the box instead of just getting the ball out of danger and it was to prove costly. ….but it didn't come. Passing really poor and imprecise. We lacked definition and any attacking threat. Parejo had one of the best chances after a one-two with Gameiro but shot straight at the keeper. Guedes was fairly lively after coming on, but his shot was unable to beat the keeper and when he found Gameiro, the latter, as so often happens this season, was offside. Rayo actually looked more likely to score but fluffed a couple of counter attacks. However, at the end, they sent a cross in, Paulista, for the second time, screwed up with Neto pulling off a great save. It was all for nothing, though, as Rayo scored from one of the resulting corners. After doing the hard part of beating Sevilla and Real Madrid it's a sickener to lose to a team that hadn't won since January, with Valencia's 16-game unbeaten run ending tamely with a whimper.